Agate is the Mystical birthstone for September. It is also the birth stone for the Zodiac sign of Gemini (see the birthstone list for other references to agate). Agate is the accepted gemstone for the 12th and 14th wedding anniversaries. A very small sample of some of the many agates which are found all over the world. A hard stone, usually within the range of 7-9 on the Mohs scale agates are found in all colors of the rainbow, although green and blue are quite rare. Agate is a variety of chalcedony formed from layers of quartz which usually show varicolored bands. It usually occurs as rounded nodules or veins. Often tiny quartz crystals form within the stone and add to the beauty and uniqueness of individual stones. These crystals are called drusy (sometimes misspelled as druzy). Lapidaries often cut just the drusy from an agate and jewelers use these drusy cabochons as the main stone or as an accent stone in their jewelry designs. Some named varieties are: moss agate, eye agate; and plume agate, which looks like it's filled with beautiful feather plumes (see more agate variety names). 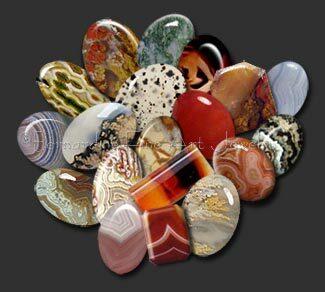 Agate is a relatively inexpensive stone except for some varieties with unusual banded or scenic markings. In recent years, Montana agate has gained wide acceptance in jewelry and well cut stones with nicely defined patterns often exceed the price of some of the more well known gemstones. Plume agate is another that often brings high dollar. Pictures and description of Montana Agate. It is believed to prevent insomnia and insure pleasant dreams, to enhance personal courage and protect one against danger. Agate provides a calming influence, improves perception, concentration and helps to develop and increase one's analytical talents. Designer jewelry made with agate including Montana agate men's ring. A selection of freeform cabochons and rough available for custom jewelry designs. 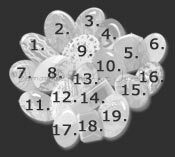 More facts and legends about the birthstone agate, plus agate jewelry listed by type.